In AWR, you can add, group, import, export and delete keywords with ease. To start tracking new keywords in your project, you add them one per line in your Keyword Settings. Before clicking “Save”, you can also assign them to a pre-existing keyword group. Keywords can also be copy-pasted from a list. Using the import tool in your keyword settings you can also import keywords from a file. The recommended file format is .CSV, with UTF 8 encoding, and keywords should be written one per line, just like in the example above. Keyword groups/tags can also be added to the keywords, and separated using commas, as in the example below. Afterwards, you simply click “Import keywords”. To manage keywords in your Keywords Settings, you simply check them and click the Manage menu. This is where you can assign keywords to keyword groups, and ungroup the ones that were already assigned. Such keywords will appear with tags which show the group or groups that they are part of. You can also change the color that assigned to every keyword. This is the color associated with the keywords in charts both in the Keywords Ranking section and and Keywords Ranking Chart widget in the Reports section. Deleting a keyword will also remove all of the historical ranking data associated with it, which will not be restored if the keyword is re-added. 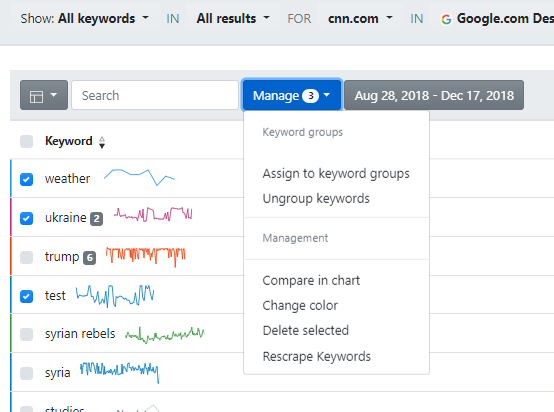 In the Keywords Settings menu, you can also filter the view between all keywords, keywords that are not assigned to any keyword groups, and keywords that were assigned to keyword groups. Here, you can also manage your groups, by renaming the existing ones, adding new groups or deleting them. The deletion of a keyword group means that all ranking data at keyword group level will be lost, and this will not affect the keywords that were previously assigned to it. All of the keywords you’re tracking can be exported, along with keyword groups and the day they were added to the project by clicking “Export”. In your Keywords Ranking section, you can check keywords and group them, change their chart colors and delete them, just like in the Keywords Settings. You can also filter the ranking positions for all keywords, keyword groups, and unassigned keywords. The Keywords Ranking section also allows you to rescrape keywords for up to 150 resource units a day. Rescraping will manually update their ranking positions for the last update performed for the project. Here, you can also check up to 10 keywords and compare the evolution of their ranking positions in a chart.